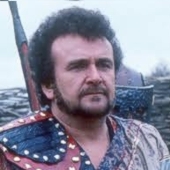 The Trial of a Time Lord ("The Mysterious Planet" and "The Ultimate Foe") & "Dragonfire"
Tony Selby was born in February 1938 in Lambeth, London. He trained at the Italia Conti Stage Academy. He has been described as a congenial character actor whose best film roles came in two vastly different films in 1971 and 1972 - Richard Burton's Villain and Spike Milligan's Adolf Hitler - My Part in His Downfall. With his down-to earth, friendly London voice he was a regular on a number of television shows since his debut in No Hiding Place in 1964. These include during this period: The Avengers, Department S and Catweazle. His other film appearances include Alfie (1966), Superman (1978) and, An Alligator Named Daisy (19??). Further television roles include Get Some In (1975), a main part in Love Hurts (1992-94) and more recently in Burnside (2000). Perhaps his greatest contribution has been in guest appearances where his charisma, which can be menacing when he chooses, has seen him pop up in varying shows, namely - Minder, Casualty, Lovejoy, Holby City, The Bill and Eastenders. He has appeared three times in Doctor Who as Sabalom Glitz. Firstly in the first four episodes of the 1986 Sixth Doctor story The Trial of a Time Lord ("The Mysterious Planet") before returning in the final two episodes ("The Ultimate Foe"). He then returned to the show for a final time in the 1987 Seventh Doctor story "Dragonfire". He was nominated for a 1997 Laurence Olivier Theatre Award for Best Supporting in a Musical of 1996 for his role in Paint Your Wagon. He was voted best actor for his role in "Dragonfire" by Doctor Who Magazine readers. One of The Doctor’s most morally complex associates, Sabalom Glitz is a career criminal and thief with little qualms about selling out even his supposed allies to secure his own survival and freedom. Despite this, The Doctor has shown a certain fondness for Glitz when circumstances have forced them to work together, noting that Glitz is not beyond redemption, Glitz in return reflecting more than once that The Doctor isn’t a bad person despite his honesty (A high praise from Glitz according to his other associates). When Glitz initially met The Doctor, he was working a couple of million years in his own future with his ‘apprentice’ Dibber, The Master having recruited them to assist him in a plan to steal various secrets from the Time Lord Matrix after three beings known only as the Sleepers managed to penetrate the Matrix and escape to Earth. As the Eighth Doctor later deduced during an inquiry into recent events on Gallifrey ("The Eight Doctors"), after the information was stolen from the Matrix the Celestial Intervention Agency arranged for a ‘puppet’ President to be elected so that they could gain the authority to arrange for a Magnetron to be used to move Earth to another location in time and space, subsequently causing a fireball that incinerated almost all life on Earth’s surface to try and destroy the Andromedean’s base on Earth and thus conceal the truth about the stolen technical information, even going so far as to arrange for Earth to be renamed Ravalox to cover their tracks. While Glitz and Dibber were able to discover the Sleepers’ base, their theft was indirectly complicated by the presence of the Sixth Doctor and Peri after they landed on Ravalox, resulting in Dibber damaging the black light generator that was keeping the Sleepers alive in stasis in such a manner that its destruction could potentially destroy the universe. Fortunately, The Doctor was able to reconfigure the generator so that the explosion was limited to the underground base while Glitz distracted the base’s robot guardian, although the robot’s destruction also damaged the archive that he and Dibber had recovered. When The Doctor was subsequently put on trial by a corrupt High Council seeking to discredit The Doctor so that he couldn’t reveal that the Matrix had been compromised, The Master dispatched Glitz to serve as a witness in The Doctor’s trial ("The Ultimate Foe"), unwilling to allow The Valeyard - the trial prosecutor and the manifestation of The Doctor’s dark side - to prevail due to the greater threat he posed to The Master. With Glitz and The Doctor’s future companion Mel to serve as witnesses, The Doctor was able to reveal that the High Council had attempted to set him up to conceal the truth about the theft from the Matrix, Glitz’s testimony confirming that the Matrix had been penetrated while Mel was able to assist The Doctor in tackling The Master and The Valeyard. Although Glitz briefly betrayed The Doctor by allowing The Master to hypnotise him and send him out to act as bait for The Valeyard, subsequently stealing what he believed to be the Matrix archives, a trap set by The Valeyard left The Master and Glitz immobilised in The Master’s TARDIS. With The Valeyard defeated and apparently killed after he tried to kill the jurors at The Doctor’s trial, The Doctor asked the High Council to show Glitz leniency after he was released. Although The Master escaped after killing the technicians who released them, Glitz was allowed to return to his own time along with Dibber. The Doctor and Glitz met again - The Doctor now travelling with Frobisher after Mel had been returned to The Doctor’s future self - when the TARDIS coincidentally materialised in Glitz’s new ship, The Doctor currently tracking bounty hunters Sha’ol and Karthakh after they had managed to infiltrate the TARDIS in an attempt to kill him. After they landed in a scrapyard where Glitz had hidden the proceeds of a recent robbery - Glitz intending to recover the goods and claim them as scrap -, the quartet were confronted by Nicolo Mandell, the head of security and intelligence for the local government, who blackmailed Glitz into getting back in touch with a gang of thieves who had stolen a Tzun data core from the Veltrochi Council ten years ago. With Glitz having fenced the stolen item and sold it to Mandell, Mandell now needed the gang to steal it back from the government research station where it was currently stored, thus saving the government from having to publically admit to the theft and thus avoiding having to deal with other requests for questionably-acquired items collected by past administrations. Glitz in particular had an interesting time on the subsequent mission when Liang, the gang’s only female member, expressed a more-than-passing potential romantic interest in him, leaving Glitz appreciating the attention but uncertain how to reciprocate. Despite the complication of Sha’ol and Karthakh’s pursuit of The Doctor, he, Frobisher, Glitz and Dibbler were able to eventually reassemble most of the old team and track down the core to its new location of the Thor Orbital Facility. Despite the security around the core - it was located on an asteroid base in a room protected by time dams shifting the room an hour into the future and the safe itself was behind dams that shifted it a day into the past, making it difficult to break into somewhere that wasn’t there yet and then ensuring that any thieves would be caught even if they acquired the core as the security staff would have known about the theft since yesterday - The Doctor was able to acquire the core by manipulating the dams to cause the core to materialise in the present while taking advantage of the asteroid base being out of phase to send the core to materialise in the location where the asteroid had been an hour ago, allowing them to easily recover it in Glitz’s ship by The Doctor arranging for the ship to take up position in that precise location while the theft took place. However, the gang were forced to flee to the Veltrochni when Mandell attempted to steal the core for himself to use the information on Tzun technology to set himself up as an arms dealer, only just escaping when Sha’ol and Karthakh, now using an Ogron ship, attacked Mandrell’s forces and ‘rescued’ the gang. Although Dibber was killed in the ensuing conflict, The Doctor was able to free Sha’ol and Karthakh from their contract by using a stolen time generator to temporarily put himself in temporal stasis long enough for them to scan him and confirm that he was legally dead, lacking a heartsbeat or brain activity while temporarily immobilised. Their contract ended, Sha’ol and Karthakh aided The Doctor, Frobisher, Glitz and the gang in returning the core to the Veltrochi despite Mandrell’s attempt to destroy them. Having tricked Mandrell into publically admitting his recent actions, the gang returned to their new civilian lives, the Veltrochi keeping the now-wiped data core in memory of what they did to the Tzun while Glitz - now officially pardoned for the original theft - decided to spend some time with Chat before moving on to his next heist. The Doctor and Glitz met again after The Doctor had met the past version of Mel and accepted his destiny to travel with her, The Doctor also regenerating into his seventh incarnation prior to the reunion. While investigating the Iceworld spaceport and the reported tales of a dragon in the underground caverns ("Dragonfire"), The Doctor and Mel met Glitz as he was attempting to search for the treasure that was supposed to be guarded by the dragon, although he was also facing financial and personnel trouble after selling his entire crew and losing the money in a subsequent card game. Despite their distaste for Glitz’s recent actions, The Doctor, Mel, and their new friend Ace - a waitress on Iceworld who had been sent forward in time from 1980s Earth - joined him in his search for the treasure while trying to escape from Kane, the mysterious head of Iceworld. Although Glitz’s ship was lost during the following struggle, he gained a new ship when it was discovered that the dragon and the treasure were the same thing, with the dragon being a bio-mechanoid powered by the Dragonfire that served as Kane’s jailer, keeping the power source needed to operate Iceworld out of his reach due to his need for cold temperatures to exist. Although Kane’s mercenaries were killed when he forced them to drive Iceworld’s occupants onto Glitz’s ship before he destroyed it, Kane himself committed suicide when The Doctor revealed that his home planet had been destroyed in a supernova centuries ago, depriving him of his chance for revenge. With Glitz having taken the now-mobile Iceworld as his new ship, The Doctor departed, taking Ace with him as his new companion while Mel departed to travel with Glitz, expressing some hope that she could keep him making further ‘dodgy deals’. It was later revealed that Mel’s unusual decision to leave with Glitz was actually prompted by The Doctor; recognising that he needed to begin his current incarnation’s more ruthless role as Time’s Champion - part of a deal he made with the Eternal Time to avoid becoming The Valeyard -, he had influenced Mel’s decision to leave him as he recognised that her morality would hold him back from what ‘needed’ to be done. After six months travelling with Glitz - including writing a cipher program that allowed Glitz to monitor interesting financial transactions in the Galactic Banking Conglomerate -, Mel set out on her own to try and get back to Earth, only to be stuck on the virtually desolated planet Avalone until she was reunited with The Doctor ("Head Games"). Glitz himself has not been seen since.